WILLEMSTAD - Last week, the Curacao Culinary Team, which was composed by KUONI and the tourism bureau CTB, were guests at the Santa Barbara Beach & Golf Resort. KUONI and CTB endorse a close cooperation between Dutch and local chefs in order to get unique culinary packages for a holiday in Curacao. Santa Barbara Resort is completely behind such endeavor. The group of chefs enjoyed, together with Dutch culinary journalists, a wonderful and delicious lunch at the Shore restaurant right next to the clubhouse of the Old Quarry golf course. This lunch was prepared and presented by young upcoming chefs. These young chefs were then in the midst of preparations for the preliminaries to be chosen to participate in the Taste of the Caribbean competition later this year in Miami - a sort of Culinary Olympics. 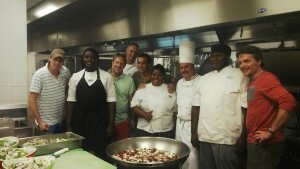 Especially for this particular group, they prepared, under the guidance of the chefs Viktor Schmidt and Dennis Bean of Santa Barbara Resort, a 3 course menu to display their culinary arts. The Dutch chefs in the delegation are Pascal Jalhay of R&D Manager Marfo, Wilco Berends of Restaurant Hotel de Nederlanden, Andre van Alten of La Provence Restaurant and Leon Mazairac of Restaurant Podium onder de Dom.